ORLANDO, FLA (November 10, 2016) – The Grove Resort & Spa today launches The Great Grove Giveaway, a new sweepstakes that will award a dozen free Walt Disney World® Park Hopper passes, accommodations for up to four nights, and $1000 in spending credits at the expansive, 106-acre resort opening in Orlando February 16, 2017. Located just minutes from Disney’s Western Way entrance and uniquely set lakefront on a portion of Central Florida’s conservation grounds, The Grove is poised to become one of Orlando’s prime family destinations; its extensive lineup of amenities – all-suite, residential-style accommodations; an on-site waterpark; multiple dining and drink venues; a spa; game room; watersports at The Grove’s lakeside pier; and access to nearby golf, shopping, and nightlife – will provide endless opportunity for both entertainment and escape. Guests of The Grove Resort & Spa will enjoy spacious residential-style accommodations with one, two, and three bedroom layouts with full kitchens, washer/dryers, and screened outdoor balconies that showcase the resort’s natural marsh, wooded landscape. A packed line-up of on-site activities and amenities include multiple restaurants and bars; the large-scale grab-and-go Alfresco Market with ice cream, gelato, fresh Boar’s Head deli meats, a barista bar, and grocery items; Surfari Water Park with a dual rider surf simulator, a lazy river, and an interactive water play structure with multiple slides; four swimming pools; The Grove’s Lake Austin Pier with a selection of watersports, paddle boats, and fishing; Hoopla, a children’s game room; and the intimate Escape Spa. 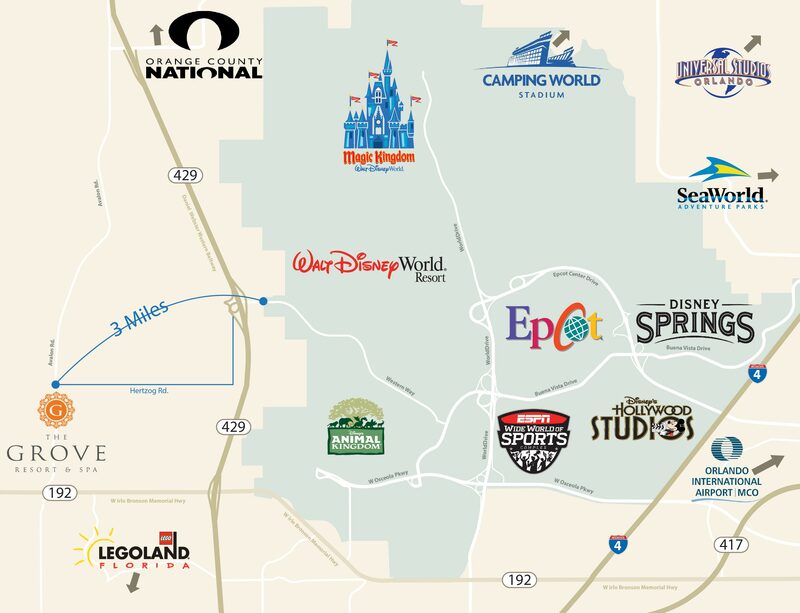 The Grove will offer convenient access to the area’s top attractions, such as Magic Kingdom® Park, Animal Kingdom® Park, Epcot®, Disney’s Hollywood Studios®, ESPN Wide World of Sports Complex, SeaWorld Orlando®, Universal Orlando®, shopping, dining, and entertainment at Disney Springs, as well as LEGOLAND® Florida (Winter Haven). Luxury shopping is also located nearby, with stores that include Gucci, Valentino, Bottega Veneta, and more. For more information, terms, and conditions about The Great Grove Giveaway and special pre-opening offer, please visit www.groveresortorlando.com. The enter The Great Grove Giveaway sweepstakes, please visit www.groveresortorlando.com/sweepstakes. The Grove Resort & Spa is operated by The Woodlands (Houston), Texas-based BENCHMARK®, a global hospitality company, as part of its signature Benchmark Resorts & Hotels portfolio. The Grove Resort & Spa is located at 14501 Grove Resort Avenue, Orlando, Florida 34787. 844.203.0209. The Grove Resort & Spa will open in Orlando, Florida in February 2017 as an expansive 106-acre hotel destination located just minutes from the west entrance of Walt Disney World®. Set on Lake Austin and amid a portion of Central Florida’s conservation grounds, The Grove will become a sanctuary from the boisterous pace of the outside world, neighboring theme parks, luxury shopping, and entertainment centers. 878 one, two, and three bedroom residential-style suites with full kitchens, full-size washers and dryers, multiple bathrooms, and screened patios will offer guests the comforts of home, while the resort’s hearty collection of amenities will deliver the luxuries of a full-service resort. Four swimming pools and the Surfari Water Park will be a focal point of The Grove experience, with its interactive water structure with multiple slides, a lazy river stretching more than 725 feet, and the first surf simulator at any Orlando hotel. Guests will also enjoy a selection of watersports at the resort’s Lake Austin Pier, an intimate spa, fitness center, and a children’s game room. Dining options will include the indoor/outdoor Valencia restaurant, Longboard Bar & Grill and Springs Bar & Grill at the pool areas, with additional food options available at the large-scale grab-and-go, Alfresco Market. 6,000 square feet of indoor space or poolside, lawn and garden alfresco venues are available for weddings, family reunions, intimate meetings, large groups, and special events.